The kim is a percusive string instrument in that the strings are struck with two special sticks. 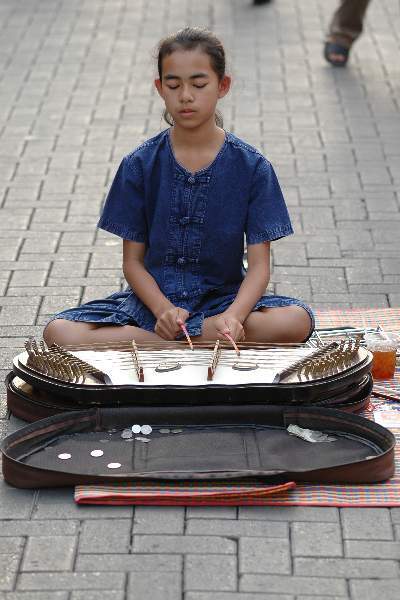 A very popular instrument with thai students. Each note is formed from three metal strings tightly drawn accross two bridges much in the manner of piano strings. The sound indeed is similar to that of the piano strings when plucked from inside a piano. The anchor for each string also closely resembles that of a piano. The similarity ends there however. Both the music played and the tuning of the thai kim is different. The sound box ,usually made of hardwood has two holes placed between the bridges and below the strings.